Boil 250g screws pasta in boil salted water. Spice one chicken fillet with chicken spices, aromat, and 4 grated fresh garlic. Stirfry in oil until golden brown. Add 60g butter in mixture. Set aside. Whisks 400 ml milk and one egg. Melt 80g butter in sauce pan. Add 2 heaped tablespoon flour. Smoothen paste and add the add aromat and lemon and black pepper seasoning and little salt to taste. Add milk and egg, stir until it thickens. Grate Gouda and mozzarella cheese. Add chicken, pasta and half of grated cheese into the white sauce. 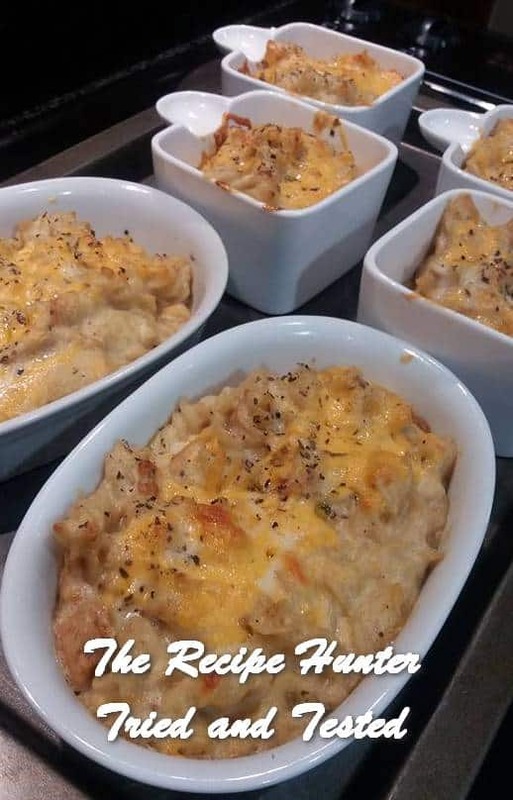 Cook and spray individual oven proof dishes and add pasta portion with grated cheese. Sprinkle with dried origanum and bake on 180C for 20 min until cheese is melt.